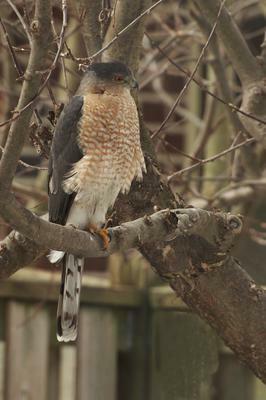 This Cooper's Hawk has been a frequent visitor to our backyard in Mississauga, Ontario this past winter. Obviously he is very hungry as he has returned many times to watch the Mourning Doves and other small birds feeding on the ground beneath our feeders. He often gets lucky and gets a Mourning Dove as they are slower than the other smaller birds.